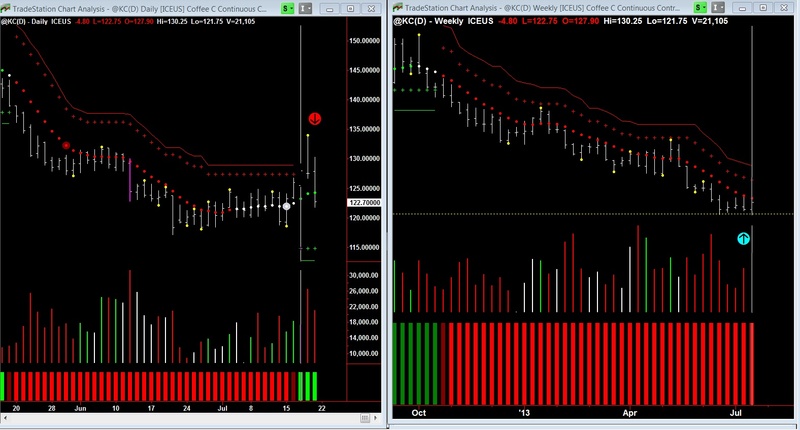 This week’s example is the coffee commodity which has has been in a downtrend since October of last year. In the weekly Chart 1, there was a wide bar shown in magenta and four weeks of tight ranging bars (cyan arrow) unable to break under the dotted line of support. In the daily Chart 2, it reversed to the upside and then tested the market with a push down (red arrow) on average volume. This does not show a new entry but rather a termination of the dominant weekly downtrend. The last bar is a test down on average volume. Classic end of trend pattern. The market should now consolidate at these levels and when you see green volume on the weekly chart (providing the daily chart keeps in uptrend) this will be the commencement of a new trend run to the upside. In other words, the market at the moment is in its accumulation phase.